October | 2012 | JUDDER! Hey there spooks and horrors! Well, let’s dive in with the big news, shall we?! It’s almost Halloween and we’re gearing up for the BIGGEST Halloween party in town! Yes, on Friday 2nd November, we’ll be opening the doors to the 2 Pigs Haunted House for a night of Judder mayhem, thrills and chills! And to help bring the bumps in the night, we have none other than ADAM LAB4 joining us on the decks! 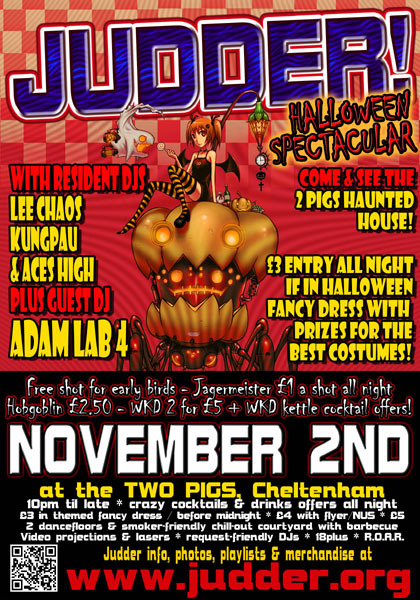 We’ve got Jagermesiter for a quid a shot, we’re open until 4am, and it’s just £3 entry all night if you’re dressed in your finest halloween costume, plus we’ll be giving out tricks & treats and awarding prizes for the best costumes – make sure you get there early, this is the best night of the year! The more observant of you will have noticed that we’ve done a BIG overhaul of the Judder website – we’ve made it easier for you to browse all the photos from more than a HUNDRED Judders – all NINE AND A HALF THOUSAND of them – as well as all the flyers, posters, setlists and other stuff to jog your memory of awesome nights past! But we’re not all about nostalgia, oh no siree! In fact we’re well into planning for 2013, which will be Judder’s 10th Anniversary year! And what we’ve decided to do is have a year of “Greatest Hits”, bringing back some of our most popular themes. which ones, you ask? Well, that’s entirely up to *you*! Yep, you can now vote for your favourites and the top 10 themes will be chosen for 2013, so let us know what you want to see! The top 10 themes wil then be chosen and announced on the last Judder of the year in December… So go here and vote Vote VOTE! 2. Mouse over the gear wheel icon next to the “Like / message” box and click it. 4. Create an interest list name and all of the posts you want to see from any Fan Page you’ve “liked” will now show up. Right, I’m off to sort out the haunted house decor and put my costume together – see you on Friday! On Friday 2nd November, we celebrate Halloween with the biggest event in the Judder calendar, and to really raise the stakes (and the roof) we have Adam Lab4 as our guest DJ! This really is the best Halloween party in town and yet again we plan to go all-out to bring you the best haunted house in town! And to wrap up the year, on Friday 7th December we have our Victorian Christmas Judder with guests A-B Riddims and special prizes for all the good boys and girls! Wow! Seeing it written down like that is kinda intimidating, but looks like ALL THE FUN IN THE WORLD! Hopefully you can join us for all the adventures!! See you on the dancefloor(s)! !